The volume is offered in honor of Daniel I. Block on the occasion of his 70th birthday. Few Old Testament scholars have worked so ably, carefully, and intentionally to help the church and the academy grasp the message of Deuteronomy. Block’s own studies always exhibit an admirable balance of exegetical rigor, literary and theological awareness, and pastoral care, and for well over a decade he has, like the priest-scribe Ezra, devoted himself to the study, practice, and teaching of the deuteronomic torah (Ezra 7:10), helping and urging others to hear the life-giving gospel of Moses in Deuteronomy. The international group of specialists that contributed to this volume consists of Daniel Block’s colleagues, friends, and former students. 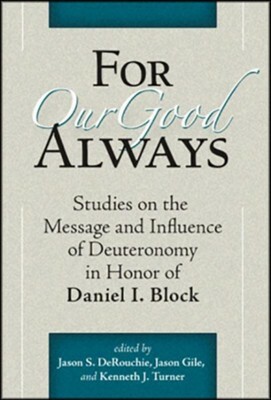 I'm the author/artist and I want to review For Our Good Always: Studies on the Message and Influence of Deuteronomy in Honor of Daniel I. Block.